When you sign up as a Reseller, you activate your account by making a minimum initial deposit of US$200 to your Registration Fund. All deposits to this account go toward your wholesale domain name registrations and services fees. Deposits, including your initial deposit, to your Registration Fund can be made online with a credit card, as well as by numerous other options to give you the most freedom. You can wire transfer funds. Bank fees and charges incurred to originate a wire transfer (including intermediary bank charges) are the responsibility of the reseller. 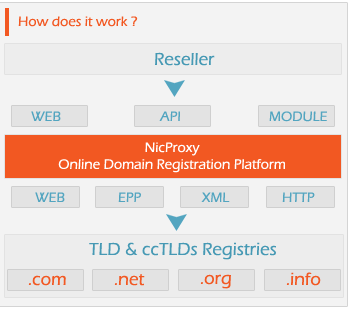 NicProxy will credit the reseller's account with the actual funds received by the NicProxy bank. Beneficiary Name: Nics Telekomunikasyon A.S.
You must include the following bank-to-bank message in order for funds to be properly credited to your account: Reseller Name, Date (DDMMYYYY) and RSP Code. When making a deposit via wire transfer, please send a confirmation e-mail to customerservice@nicproxy.com with: (1) e-mail address on account, (2) company name, (3) date of the wire, (4) originating bank and (5) amount of the transfer. Wire transfer remittances will be applied to your Registration Fund within one business day of receipt. Please ensure your reseller e-mail address appears in the sender section of the wire transfer. You may make a deposit to your Registration Fund online by using a credit card. Online credit card payments made through our Web Interface are credited to your Registration Fund immediately, making those funds available for an domain name associated transactions immediately. Turkey VAT does not apply to outside countries. Payments with Online Transaction are charged 2.0% extra costs. Please note: Online credit card payments are credited to your Registration Fund immediately. Your registration and service fees will be deducted from your Registration Fund when you place your orders. When your account balance is low, we will notify you promptly so you can replenish your fund immediately. There is no minimum deposit required after you have made the initial pre-payment deposit of US$200. The Reseller's credit limit is based on its volume, cash deposit, payments or combination thereof maintained with NicProxy. More information about Reseller Credit and Urgent Credit please contact NicProxy Customer Service. If you're not satisfied or have a need to cancel your participation, NicProxy will refund any unused balance in your Registration Fund within one (1) months after receiving a written request of your termination of your NicProxy RSP Agreement and last month invoice must be also sent to NicProxy Accounting Department by fax. No refunds will be given for any fee transactions, e.g. registrations, transfers and renewals. There may be minor changes in your refund amount due to fluctuations in international currency rates. We will refund your amount via the same payment mode through which the payment was originally received. All banking charges, including any amendment charges, are for the account of the beneficiary.